This is a sponsored post written by me on behalf of hhgregg. All opinions are 100% mine. One thing I love to do when I have a little extra time on my hands while in front of the computer is to enter sweepstakes. Yes, you really can win! I’ve won a variety of prizes throughout the years but some of my favorites include an iPod Touch when they first came out, $500, clothes, and other electronics and gift cards. They’re a great way to win things you normally wouldn’t buy and to get some free products from brands you already love. So, I wanted to share the new LG + hhgregg Play For Keeps Sweepstakes that just started with you all. One (1) LG Twin Wash System – I love that this lets you wash two loads at the same time with turbo wash capabilities! There is a limit of 1 instant win prize per person. The sweepstakes begins on 3/6/16 and runs through 4/4/16. 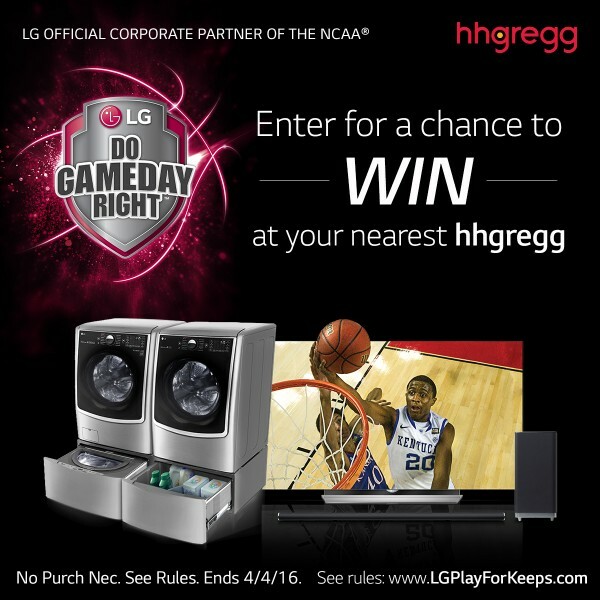 You can enter to win by going to the LG + hhgregg Play For Keeps Sweepstakes site and following the directions. You can also go to your local participating hhgregg store and get a scratch off game piece and then go to the LG + hhgregg Play For Keeps Sweepstakes website, submit the code on your game piece, and then follow the rest of the instructions. There is an entry limit of one play per person per day. This sweepstakes is open only to legal residents of AL, DE, FL, GA, IL, IN, KY, LA, MD, MO, NC, NJ, OH, PA, SC, TN, VA, WI, and WV, who are at least eighteen (18) years old at the time of entry. See the official rules on the sweepstakes site for more details. I think this sweepstakes is definitely worth entering since there’s a good amount of prizes and it’s only open in a limited number of states. Good luck!